Justin: One of my favorite films is the Fugitive, it actually really got me interested in the grandeur and architecture of Chicago. Its location shooting and ability to capture the chilly realism of Chicago still blows my mind when I watch it. In the film Harrison Ford essentially hides, ducks and weaves from pursuing authorities as he alters his identity to find his dead wife’s killer. Kat: He maintains that his wife was killed by a one-armed man. And while we didn’t meet any one-armed men in Chicago, we did go to the movies one cold Sunday night to see Martha Marcy May Marlene, one of the few films I’ve found so chilling, so harrowing, I almost walked out. After this creepy experience we went for some food and Justin noticed his wallet was missing. He thought he might have left it at the Hostel, no luck, neither at the cinema nor the supermarket. The next morning we visited the police station and retraced our steps, but at every turn it got progressively worse. Justin: I lost my travel wallet which contained, well, everything: drivers license, bank card, credit card and most importantly, my ten-year passport. This unfortunately rendered me without an official identity in chilly old Chicago. I don’t know how I lost it, it just seemed to disappear into the frosty ether. So there it is, my lesson learned big time, my occasional carelessness and forgetfulness can have devastating repercussions in the wrong place and at the wrong time. So the Chicago trip was a little hijacked, much time was spent speaking with Consulates, call centres and officials, and to be pretty frank it all went a lot smoother than anticipated. The Australian Consulate in Chicago furnished us with a true-blue, Aussie larrikin. Never before have the words “she’ll be right” sounded so damn good. Justin was his name and soothing panicked travelers was his game. The itinerary intact, we’ll soon head to Iceland then England. So back to the Fugitive, well it wasn’t as dramatic I guess but nearly as frantic and tense in some moments. We did get to visit some critical Fugitive locations too and has some local hot dogs and deep pan pizza. Theraputic hot dog with pear and brie! Kat: Yes, we visited Merchandise Mart, the place where Richard Kimble makes a call from a payphone and the US Marshalls figure out he’s still in Chicago. The whole city is recognisable from such films as Batman Begins and the eponymous Ferris Bueller’s Day Off. I love the raised tracks of the L train, which give the city a really industrial feel. Chicago is a very textured city, from the brown stone of the buildings to the enormous bolts holding the train lines in place. 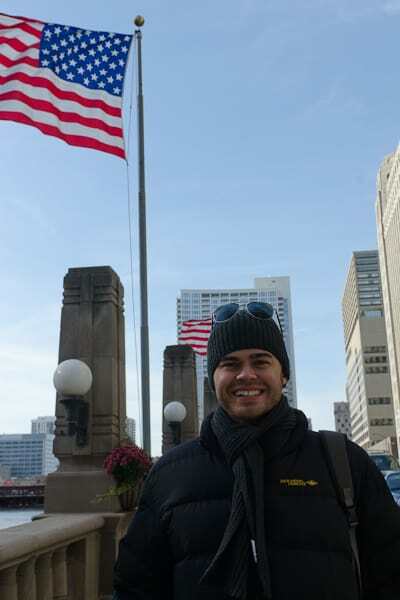 Justin: Chicago folk are definitely really open and friendly – New York with a friendlier twist I say! And the city is drop dead gorgeous, such outstanding planning and beauty, architecture just boggles your mind, like New York the city in itself is the best tourist destination you could imagine. Kat: In between consulate trips we did manage to visit the Museum of Science and Industry, set in the same building that held the 1893 World’s Fair. The fair was a fascinating time for Chicago; Nikola Tesla demonstrated the first use of alternating current and the Fair was illuminated with electricity. A novelty in those days. The Fair was also notorious for the serial killer H. H. Holmes who opened a hotel nearby simply to kill tourists! The museum is now all kid friendly and we viewed exhibits on creating tornadoes, futuristic inventions and Dr Seuss. Embracing our inner kid we ran around all the great displays including a to scale working train model of Chicago. While Justin was busy skyping banks I also took myself off to the Chicago Zoo, a great free attraction on the edge of Lake Michigan and in the heart of Lincoln Park. It always amuses me when international zoos have a kangaroo exhibit; they’re not really rare animals to an Australian (and sometimes even dinner…). But it’s always relaxing to watch animals at play. My favourites were the African cockroaches who had their own personal exhibit, however they’re difficult to catch on camera so here’s a cute little meerkat instead. Justin: This city really completed the blues trail going all the way up from New Orleans. We had Appalachian mountain music which underpinned country and western, bluegrass, and various types of American folk music; New Orleans and the Mississippi which gave birth to blues and jazz. Kat: Don’t forget Nashville and Dollywood. Can’t have country music without Dolly Parton. Justin: This one loop really captured and took us into the heart of true American music, right at its roots and core. Great music sprung from in many instances poor people, sometimes going through genuine hardship where music wasn’t necessarily an escape from reality but part of reality. It was about community and telling your story and true experience through the notes. I love that raw, pragmatic and real aspect to American music, I think it’s why they simply so far ahead of any nation producing the best of folk, jazz and blues. Kat: But sadly we didn’t get to any Chicago blues clubs due to Monkey 2 having no ID. But on Friday Justin did get an emergency passport. He is the fugitive no more. An anxious time for the parents as well!!! !